Still busy with my new house, which is why I completely forgot the start of this new challenge! However the moving did make me an actual garden-owner, which does make this challenge - In My Garden - more fun! Luckily I had a mani in the vault from last challenge (where we were inspired by each other), which I didn't manage to post. It is quite fitting, since it depicts what my dream garden would look like! 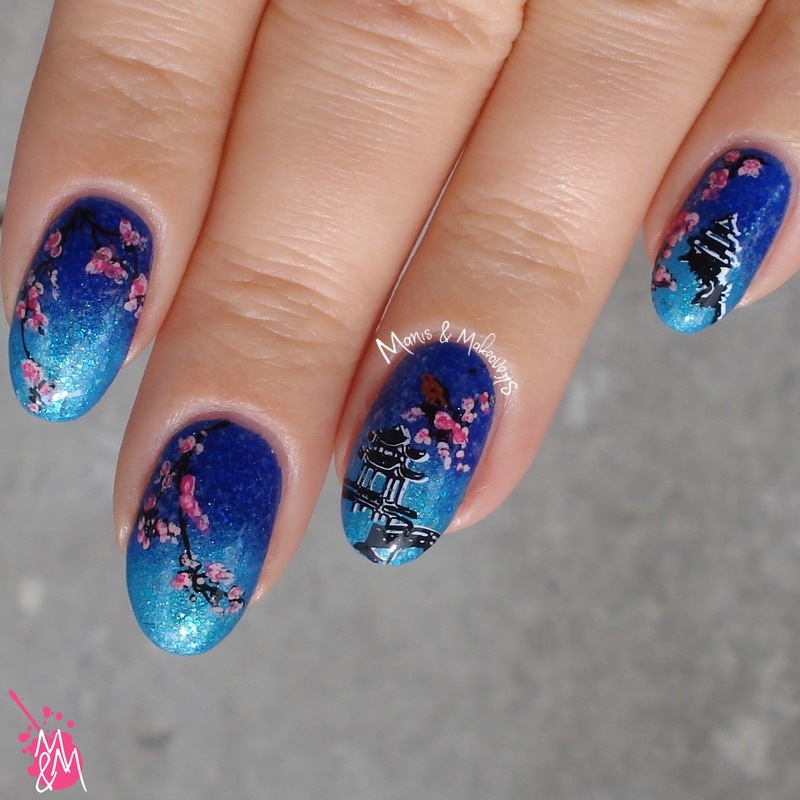 It is inspired by this wonderful manicure by Oksana - a.k.a. The Polished Koi. The base shades are not the same, because I was drawing from memory as I did this, but all in all the inspiration is clear! 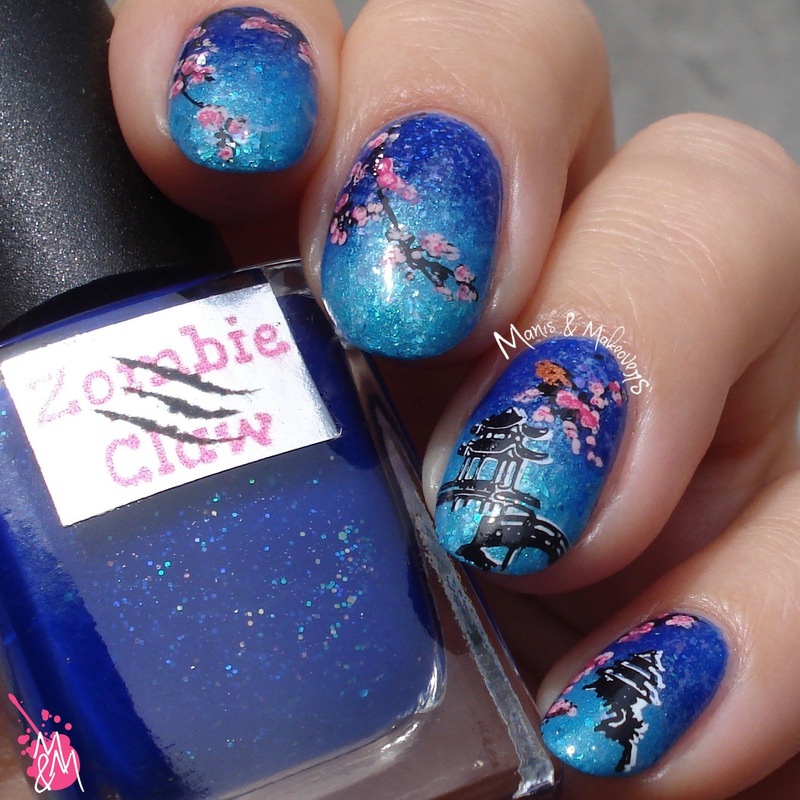 I used a base of Zombie Claw Polish "Nittany" and Ms. Sparkle "Aquamarine", topped with Ms. Sparkle "Mystic". I then stamped with HēHē-100 and 102 from the recent Hard Air collection, using BPS black and white. For the bird I stamped with BPS bronze as well. The flowers were done using a toothpick and BPS baby and bright pink. I sealed it all in with SV. So someday, when I'm super rich and live in a castle, one of my gardens will be like this. What does your dream garden look like? 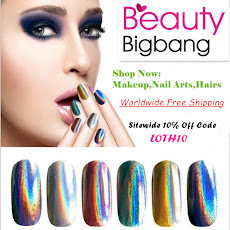 Now let's go and check out the other ladies' manicures in the links below! Wow! 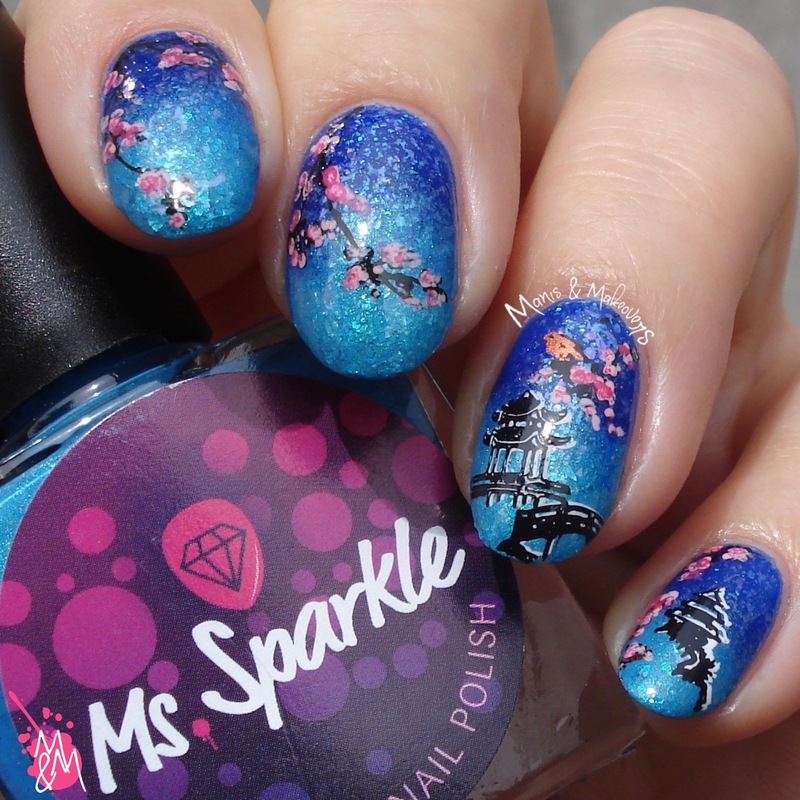 This is one of my favorites of your nail art - so pretty! 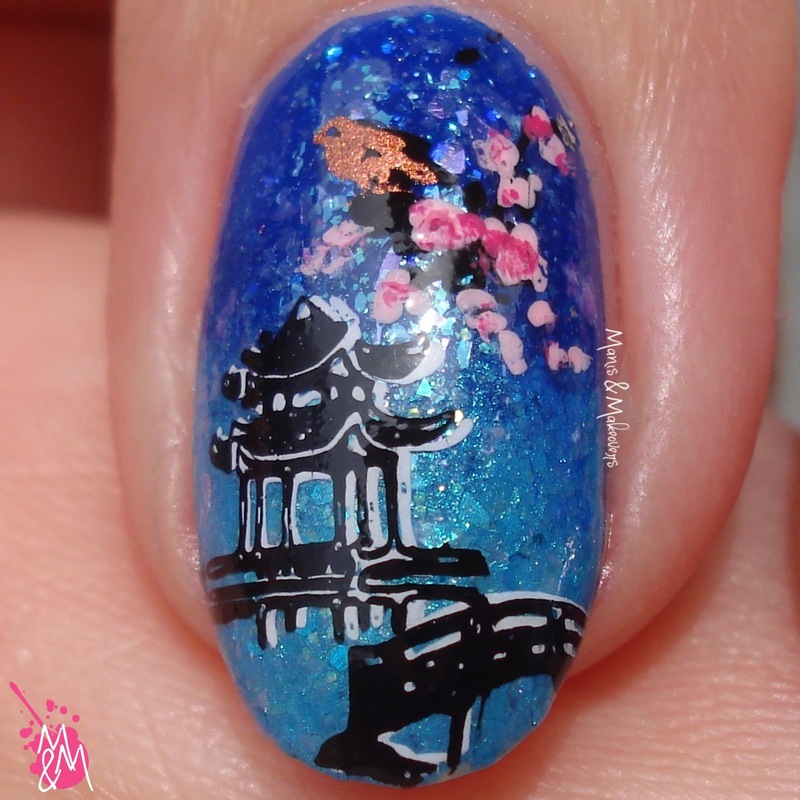 When I fist saw photos of this mani pop up in my feed my jaw actually dropped. It is absolutely stunning and you should be very proud of it, it's just as gorgeous as the inspiration mani. 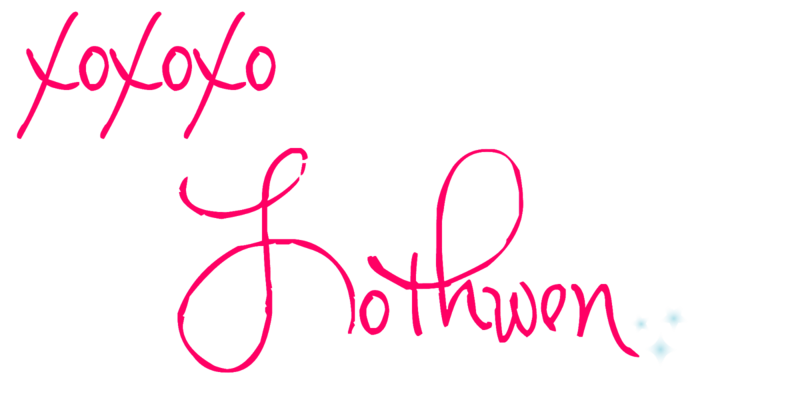 This is is so gorgeous! One of my favourite looks from this theme for sure!